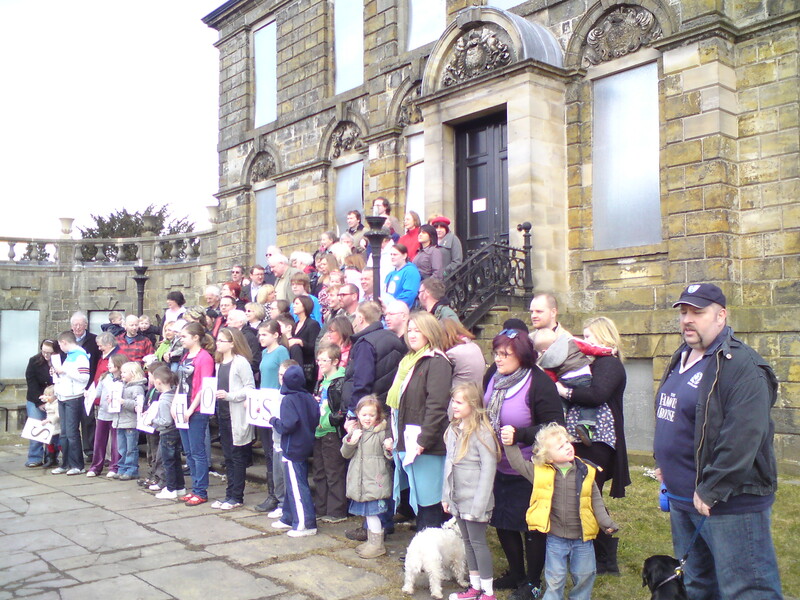 On Sunday the park played host to Cumbernauld’s first Flash Mob. The ‘Mob’ organised by the Save and Preserve Cumbernauld House Facebook group was attended by 130 people who are concerend about the house and park area. For those of you not familiar with the term FlashMob – this is gathering of people for a like minded cause usually as a photo op (as in this case). Flash Mob’s usually don’t have a purpose but this one did in that it was a way of drawing attention to the plight of the house which is currently sitting derelict. It was great to see the park busy again and the beautiful weather really helped make the day a fun occasion. many members of the Friends group were out for the photo and there was even a piper who came walking through the park as the photo was about to be taken. Fantastic impromptu performance by Ian Page and it really lent itself to the strong sense of civic pride that came about as part of the Mobbing. A good time was had by all from kids, to grandparents, from politicians to concerned citizens. This entry was posted in News items and tagged cumbernauld, cumbernauld house, flash mob, house, park. Bookmark the permalink.